Free Shipping Included! 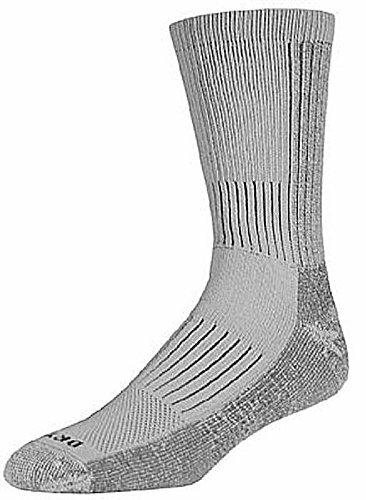 DryMax Hiking HD Crew, Gray, W5-7 / M3.5-5.5, 2 Pack by Drymax at Ultra Fitness Tech. Hurry! Limited time offer. Offer valid only while supplies last. Hiking is one of the most fun outdoor activities, enjoyed by people of all ages. Hiking can be a challenge depending on the location or weather. Hiking is one of the most fun outdoor activities, enjoyed by people of all ages. Hiking can be a challenge depending on the location or weather. Hiking gear can make a big difference, as using the wrong gear can ruin the fun or bring about big trouble. Wet socks are a hiker's worst enemy, especially in cold or freezing temperatures. Moisture pulls heat away from the skin 23 times faster than air, and can reduce skin temperature so rapidly that wet feet feel painfully cold. Wet skin makes the feet much more susceptible not only to frostbite, but also to blisters. Drymax Hiking Socks have a special Dual Layer Moisture Removal System. This system instantly moves moisture from the skin, through the inner Drymax layer to the outer absorbent layer, keeping feet dry. Staying dry is critical to remaining warm, comfortable and safe in cold weather.